This is a collaboration with German artist Chris Killerartworx. This first print run in purple is limited to 60 items. Design Name: "The Telling Eye"
Shirt Colors: Pink, Slate Blue, White, Yellow, and Mystery! Print Size: Approximately 9" x 15"
Garments: Some of the shirts are brand new that were being discarded and other shirts are pre-owned shirts that have been washed, treated and ready for their second life. 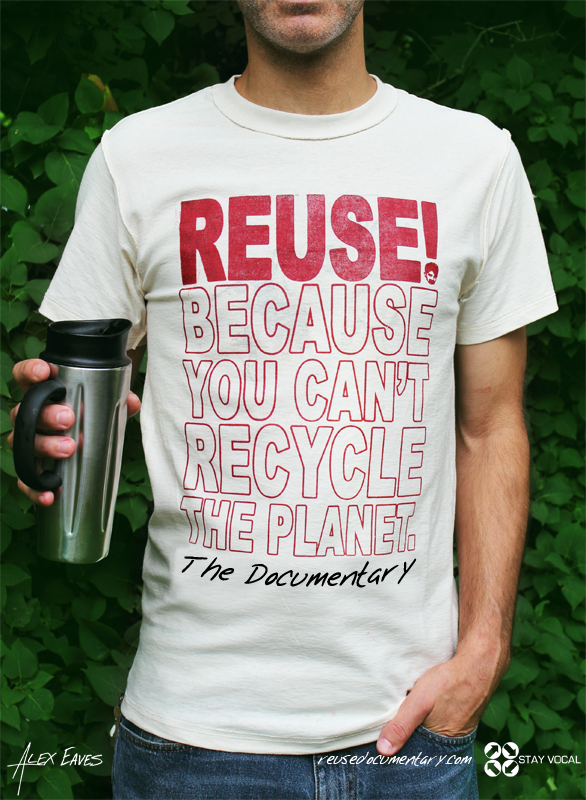 Reuse Style: Some of these shirts are printed on the reverse side (inside out), but many of them are blank shirts. For the inside out shirts, we only use T-Shirts with minimal printing on the outside to prevent any possible discomfort. But as most of us have been wearing ReUse inside out T-Shirts for a while, we can honestly say that you won’t even notice. This artwork was actually an entry by Christian in a contest that we ran a while back for a band. As it was not the winning design, we put it in the archives to possibly use later. And that time is now! The teardrop reads "By wearing this shirt, you are reducing the millions of pounds of discarded textiles that end up in landfills each year, saving energy, materials, and inspiring new ideas for change." Christian's gigantic portfolio includes numerous bands, clothing brands, and skateboard companies, even some close friends of STAY VOCAL, like Bent Left.